I have a budding architect child, so Andrea Beaty and David Roberts's book Iggy Peck, Architect touched me in so many ways. The story had me asking myself the question, what would I have done if my two-year-old had the inclination to build towers, statues and temples with all manner of things including dirty disposable nappies? Iggy's teacher's view of architecture stifles his creativity and turns Iggy's experience of school into something boring. However, while on an outdoor excursion, it is Iggy's ingenuity that saves year two and Miss Greer from being stranded on a small island. 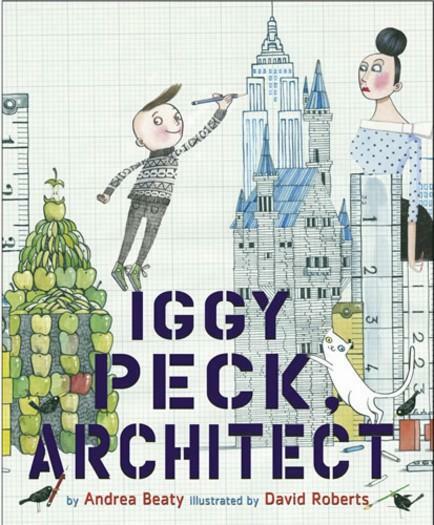 I found Iggy Peck, Architect an inspiring story about allowing children to dream big and create. Beaty uses beautiful rhyming text that makes this book a delight to read aloud and Roberts's illustrations are a fabulous combination of line and colour. Beaty and Roberts have co-created other stories that inspire children to follow their passions and to dream big; Rosie Revere, Engineer and Ada Twist, Scientist.